What's big, has everybody talking and will cause a great deal of joy and sadness on Friday morning? No, not the Scottish independence referendum: we mean the iPhone 6 and iPhone 6 Plus, which go on sale Friday - but not to many of the people who ordered theirs from Phones 4u, which went into administration this week after everybody else's pre-orders had already sold out. 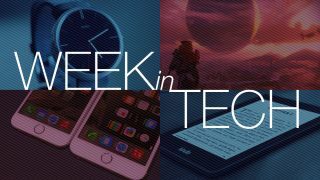 This week we discovered whether Apple still leads, or if others have taken its crown. Not only that, but we've got the latest Sony Xperia, a bunch of new Kindles, the Moto 360 and a date with Destiny. Has Apple perfected the phone? The iPhone 6 is bigger, better, sleeker and faster than ever before - but the days when Apple had the good smartphone market to itself have long gone. How does the iPhone 6 fare against Android's finest? Gareth Beavis knows, and he reckons it's "sensational, but not flawless." The screen isn't full HD and, as we're sure you already know, it's awfully expensive - although not as expensive as the even bigger iPhone 6 Plus. The good Mr Beavis reckons you should make sure you really want one: it's designed for "a very particular client base." We think he means rich giants. New iPhones mean a new version of iOS, and the arrival of iOS 8 appears to have many iPhone 4S owners cursing Tim Cook as their smartphones slow to a crawl. On more recent devices, though, there's a lot to like - and Matt Swider can explain what, where and why. Not everything works yet (don't enable Cloud Drive until Yosemite ships if you want to keep syncing with your Mac) but there's lots of cool new stuff. We're particularly pleased about the third party keyboards. Sony, it's safe to say, isn't doing very well at the moment. Its solution? Shift strategy and in mobiles, concentrate on the premium smartphone market. Sony's problem isn't so much the hardware - devices such as the new Xperia Z3 are great - as Sony's relationship with carriers, particularly those in the US and China. You can tell Christmas is coming: Amazon's announced a whole bunch of new Kindles it hopes you'll buy for everybody you know. There's a new Kindle Fire for kids called the Kindle Fire HD Kids Edition, updated Kindle Fire HDs and Kindle Fire HDXes, and a new higher resolution ebook reader called the Kindle Voyage. Matt Swider has spent a week with Motorola's Moto 360 smartwatch, and that time has exposed a fatal flaw: its battery life is terrible, which means that after a long day it's not much more useful than a sundial. It does look quite nice, though. This week Bungie's Destiny broke records: its launch is the most successful of any new gaming franchise, which is a corporate way of saying it's sold a bajillion copies. Unlike Bungie's Halo franchise it's available on PS4 too, and that encouraged us to revisit our PS4 review to see how it looks now there are lots of decent games and streaming services for Sony's console. It's still the most powerful console in the world, and now it's starting to deliver on its promises . The Scots aren't the only people who want to change the world this week. Google wants to change the world too, and CEO Larry Page has set up a special Google 2.0 task force to solve issues such as, er, making Google more accessible to kids. Thankfully Google 2.0's other plans are more ambitious: they're designing cities of the future, more efficient airports and better forms of security. Google's Calico still beats them on ambition, though: it's trying to cure death. And finally, Samsung has confirmed the release date for the Galaxy Note 4. The phablet will go on sale in the UK on October 10 and in the US on October 17, with pre-orders now open. You can see what we thought of the phone in our Galaxy Note 4 hands on review.